The most extraordinary way to experience the Falklands, South Georgia, and Antarctica. Ten photo pros and eight naturalists on board our private ship. More personal instruction, attention, and more inspiration to hone your craft. We limit this workshop to 60–70 guests maximum—so you’ll feel welcome and cared for—instead of being one among hundreds on a tourist ship. We go where other ships can’t, so you can capture more unique, amazing photographs. We have more landings and excursions and you can be on every one of them, every time. Single occupancy and double occupancy cabins available. Airfare up to $1,500 USD is included! ALSO included: trip cancellation, travel medical, and emergency evacuation insurance, so you can book now without any worries, and have something truly special to look forward to. For this journey, we’ll be traveling aboard the ice-strengthened vessel M/V Ushuaia. Originally built for the United States agency NOAA (National Oceanic & Atmospheric Administration), the Ushuaia has been refurbished to accommodate our small group of photographers passengers in 46 comfortable cabins and suites. The well-appointed public areas feature a large dining room, an open-plan observation lounge/lecture room with modern multimedia equipment and well-stocked bar. Ample deck space provides plenty of vantage points for photography, and a full complement of zodiacs ensure wildlife viewing opportunities along the otherwise inaccessible coastline. The Ushuaia’s captain, officers, crew, and expedition staff are all highly experienced in Antarctic navigation, and have great enthusiasm for the region; we are welcome to visit them in the bridge. Meals on board are quite good—the breakfast buffet has both continental and hot options, lunch is served at your table, and the day ends with a three-course dinner. You won't go hungry! Mealtimes are set by us, and are based on our shore excursions—photography first. Questions? We are always available by email or you can call us anytime at +1 917-854-8118. EXPEDITION FAQ. You must be able to embark and disembark zodiacs in possibly rough waves and you must be able to handle walking in snow and on possibly slippery, uneven ground. Please note: The below itinerary is a representative guide only. Our exact route and program may vary with local weather and ice conditions, as well as wildlife viewing opportunities. Our prospective route will be evaluated daily by the Captain and/or Expedition Leader, and a program sheet will be issued on board each morning. Flexibility is the key to success. October 13, 2020: Arrive in Ushuaia, Argentina anytime before 2:00 PM today, then meet us at the Albatros Hotel between 3:00 and 5:00 PM for introductions and important pre-embarkation information. October 14, 2020: We’ll be embarking the M/V Ushuaia at 4:00 PM. After a welcome drink, we’ll introduce the MW Team and our expedition staff, and then you’ll have some time to get to know your new shipmates. 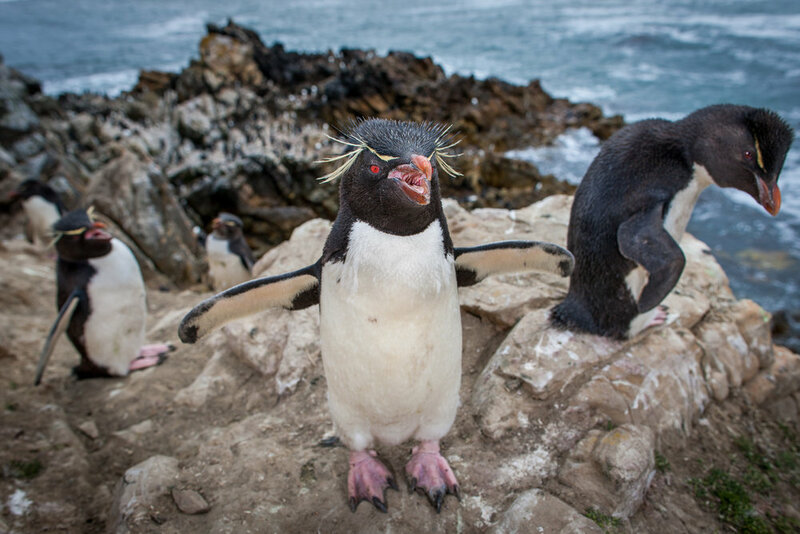 We’ll set sail this evening for the western Falkland Islands, known for their rugged beauty and wealth of seabirds. West Point Island lies off the most north-westerly point of mainland West Falkland. An attractive settlement sits on the edge of a small harbor on the eastern side of the Island, in the lee of Black Bog Hill and Michael´s Mount. The valley between these two peaks rolls over the center of the island to the dramatic Devil´s Nose, one of the Island´s main draws. From here visitors are treated to splendid views of Cliff Mountain, the Island´s highest point at 1,250 ft (381 m), and the highest cliffs in the Falklands. We hope to encounter a vast colony of rockhopper penguins and black-browed albatross here, nesting in close proximity to one another. Carcass Island lies to the north-west of the Falklands archipelago. A mature tussock plain covers much of the lower ground below Jason Hill to the east. The availability of abundant cover—and the absence of cats, rats and mice —have allowed for a large population of small songbirds. Gentoo and Magellanic penguins also nest here, and Peale´s and Commerson´s dolphins frequently approach the shoreline. The settlement here has beautiful gardens, and we may be invited for tea with the locals. Following an overnight sail, we will arrive this morning in the quaint town of Stanley. Established in the early 1840´s as a ship repair stop, and later as a base for whaling and sealing expeditions, the town today boasts a charming Museum, souvenir shops, pubs, and a fish and chip house. For those interested in outstanding wildlife, look no further than the outskirts of town. Southern giant petrels, kelp gulls, and dolphin gulls patrol the shoreline, the endemic Falkland steamer duck feeds in the coastal shallows, and turkey vultures are regularly found perched on prominent buildings. Less obvious but no less frequent around Stanley are black-crowned night herons, red-backed hawks and peregrine falcons. Take a stroll around the town gardens to see Upland geese, and a variety of songbirds as well. In the early afternoon we’ll depart the Falkland Islands for South Georgia. We have an extensive lecture program planned for you during our days at sea. Our signature image review sessions and lectures will be offered throughout these days, enabling the Muench Workshops pros and expert naturalists to share their knowledge of photography, wildlife, and the unique ecosystems we will be encountering. Elsehul is a beautiful little harbor, situated at the northwestern extremity of South Georgia, on the eastern side of the knife-edged summit ridges of the Parydian Peninsula. It is the only visitor site on the island. Colonies of nesting black-browed and grey-headed albatrosses nest above the harbor sheltered waters, and are easily observed by zodiac. Historical records for Right Whale Bay date back to at least 1922, when South Georgia was still a center for commercial whaling. Situated between Craigie Point and Nameless Point, along the north coast of South Georgia, the bay’s black ashen beach is home to a small colony of king penguins, giant petrels, gulls and breeding elephant seals. Sometimes called the “Serengeti of the South,” Salisbury Plain is a wildlife site without parallel. Several large glaciers provide dramatic backdrop for tens of thousands of king penguins nesting among tussock grass. We’ll be literally surrounded by throngs of curious, gentle penguins. Southern Giant Petrels and Elephant seals also abound. Prepare for an awe-inspiring experience as huge male elephant seals joust on the beach and female elephant seals tend to their heavy big-eyed pups. Fur seals will also be present at the back of the beach. Prion Island is a beautiful islet covered in tussock grass, and an ideal nesting site for wandering albatross. The site offers comfortable viewing platforms, accessed by wooden boardwalk, where we hope to watch the albatross engaged in their spectacular courtship displays. Grytviken lies within King Edward Cove, a sheltered harbor tucked between Hope Point and Hobart Rock on the western shore of Cumberland East Bay. The rusting ruins of the Grytviken whaling station are situated on a level plain at the head of the cove. Now the site of the South Georgia Museum, the station remains a focal point of interest for many visitors, as does Sir Ernest Shackleton´s grave in the nearby whaler´s cemetery, and his memorial cross on Hope Point. The scenery in this area is exceptionally beautiful, even by South Georgia standards. The glaciers and snow covered peaks of the Allardyce Range—Mt. Sugartop, Mt. Paget, Mt. Roots, Nordenskjöld Peak, Mt. Kling and Mt. Brooker—form a magnificent backdrop to the cove, and the views from King Edward Point in particular must be among the finest on earth. Godthul is a 3km long inlet, situated 9km east of Cumberland East Bay, on the eastern shores of Barff Peninsula between Cape George and Long Point. A floating factory ship was stationed here each summer between 1908 and 1929, and a small shore depot supporting the whaling operations was established close by at the southeast corner of the harbor. Rusting barrels, wooden boats, and scattered bones are fascinating relics of the whaling era. Today, gentoo penguins are abundant on Godthul’s tussock plateau and light-mantled sooty albatrosses nest in the cliffs that encircle the harbor. The surf-tossed coastline at St. Andrews Bay runs north-south in a 3km long uninterrupted sweep of fine dark sand, bounded in the interior by the Cook, Buxton and Heaney Glaciers. The bay hosts the biggest colony of king penguins on South Georgia, and early in the season, fur seals and elephant seals are also abundant. Leopard seals patrol the rocks at this end of the beach, hunting for penguins along the edge of kelp beds. Sheathbills dart in and around the penguin colony, and Cape petrels nest in a small number on the cliffs north of St. Andrews Bay. A few white-chinned petrels and light-mantled sooty albatrosses nest on the tussock slopes. Brown skuas and Antarctic terns breed on the outwash plain and scree slopes at the north end of the beach. Cooper Bay is an indentation in tiny Cooper Island, at the southeast extremity of South Georgia. Cooper Island holds Special Protection Area status; it is important for its vast colonies of chinstrap and macaroni penguins, snow petrels, Antarctic prions, and black-browed albatross. We’ll likely also spot fur seals on the beach. Drygalski Fjord is also located in the far southeast of the island. The glaciers found in this dramatic fjord have retreated significantly in recent decades, but they still remain one of the most striking features of the coastline. With a little luck, we may get a chance to see a glacier calve. The next two days will be spent crossing the Scotia Sea towards the Antarctic Peninsula. Take advantage of the time to be out on deck, catch up on some reading, check through and edit your photos, or simply reflect on the magical experiences of South Georgia. Lectures and our signature image review sessions will be offered throughout these days. We hope to have a chance to view the enigmatic Elephant Island either from the zodiacs or from the ship. Sir Ernest Shackleton fans will need no introduction to this historic windswept island. In 1916 Shackleton was forced to leave 22 of his men stranded on these shores, while he and five others embarked on an unbelievable last-ditch rescue attempt. What followed is one of the greatest rescue stories of all time. The east side of the Antarctic Peninsula traverses the Antarctic Sound northwest-to-southeast. Hope Bay and the Argentine Station Esperanza are located on the western side of the Sound. Esperanza is one of only two civilian settlements in Antarctica, and a variety of scientific initiatives are undertaken here annually. Brown Bluff is located on the Tabarin Peninsula, south of Hope Bay. 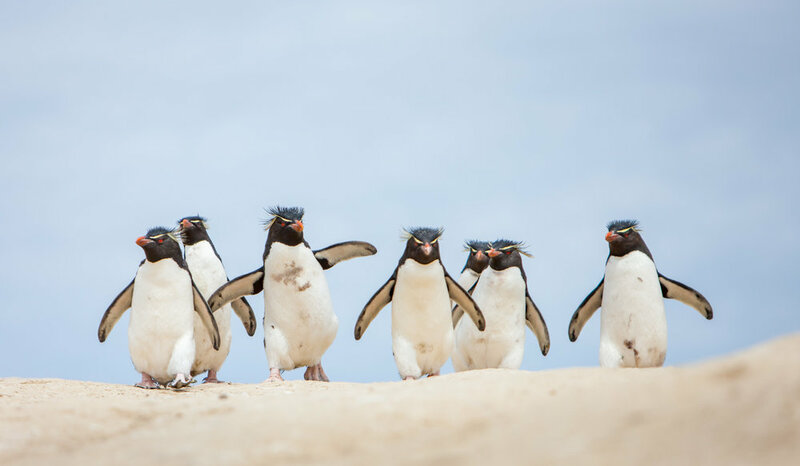 The site has been identified as an Important Bird Area (IBA) by BirdLife International because it supports a breeding colony of about 20,000 pairs of adelie penguins, and about 550 pairs of gentoo penguins. Other birds nesting at Brown Bluff include Cape petrels, Wilson's storm petrels and kelp gulls. 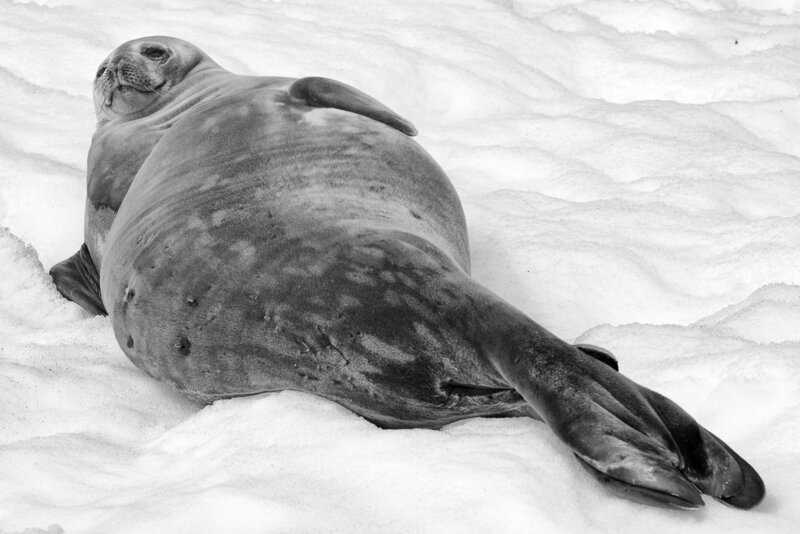 Weddell seals regularly haul out here and leopard seals often hunt offshore. The Gerlache Strait separates the Palmer archipelago from the Antarctic Peninsula. It offers scenic cruising through snow-covered mountains and large icebergs, and is also a popular place for spotting humpback whales. The Hydrurga Rocks are a small group of islets east of Two Hummock Island in the Palmer Archipelago, at the northern entrance of the Gerlache Strait. Chinstrap Penguins, Blue-eyed Shags and Kelp Gulls are confirmed breeders here. Dark, rocky Cuverville Island lies in the scenic Errera Channel, at the center of the Gerlache Strait. 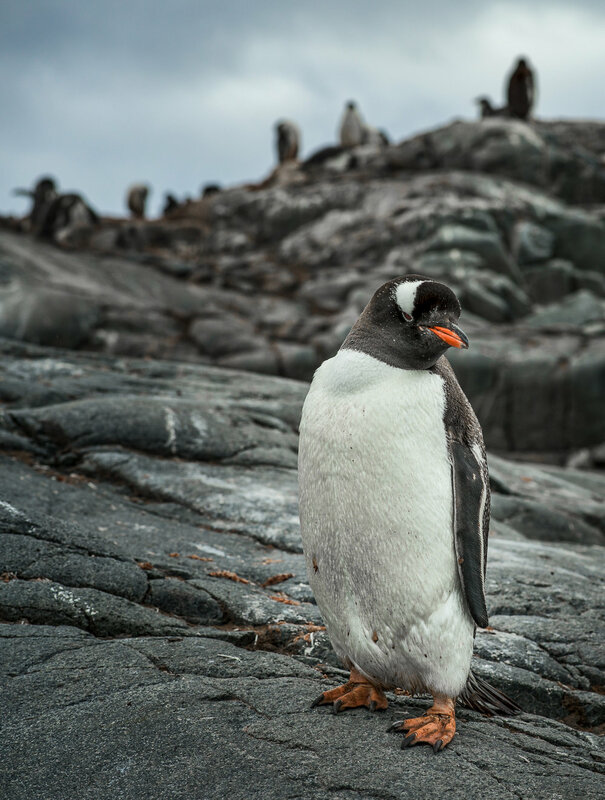 The island has been identified as an Important Bird Area (IBA) by BirdLife International because it supports a breeding colony of about 6500 pairs of gentoo penguins, the largest for this species on the Antarctic Peninsula. Other birds nesting at the site include southern giant petrels and Antarctic shags. Deception Island is an active volcanic crater, accessed by a narrow inlet. Remnants of an old whaling station still line its steaming black sand beaches, and a walk up the caldera wall provides impressive views across the crater and out to sea. A handful of birds nest here, including Antarctic shags, and chinstrap penguins can sometimes be spotted on the beach. Crescent-shaped Half Moon island stands in the entrance of Moon Bay, between Greenwich and Livingston Islands. The island has been identified as an Important Bird Area (IBA) by BirdLife International because it supports a breeding colony of about 100 pairs of south polar skuas. The island also supports about 2000 pairs of nesting chinstrap penguins, as well as a number of terns, gulls, storm petrels, petrels, skuas, sheathbills and shags. Weddell and Antarctic fur seals regularly haul out on the beaches, and whales are often spotted just offshore. November 4, 2020: Disembark M/V Ushuaia at approximately 8:00 AM. Expedition concludes. We’ll have transportation arranged from the pier to the Ushuaia Airport. Flights can be arranged for anytime after 12:00 PM this day. Trip Cancellation, Medical, and Evacuation insurance included (you book it, we credit you). Air transportation to/from Ushuaia, Argentina over and above $1,500 per person. Single rooming in Ushuaia (if requested). Meals in Ushuaia before and after our expedition dates. Passport and visa fees. Items of a personal nature. Alcoholic beverages and soft drinks. Tips for the ship’s crew (recommended $15 per passenger per day). Ship to shore communication (ship’s email, satellite phone). Anything not specifically listed as included. Prices are listed here. A non-refundable deposit of 30% is due upon registration and will secure your spot on this expedition. Based on cabin choice, a further non-refundable payment is due November 1, 2019. Final non-refundable balance will be due by June 1, 2020. Your payments are firm commitments and are not refundable, which is why we cover your trip cancellation insurance. Payments to Muench Workshops can be made by your credit card, personal check, or bank transfer. Airfare included: We will pay, in the form of credit to your account, up to $1,500 per person for airfare. All you have to do is show us your booked itinerary and receipt and we reduce your tuition by that amount, up to $1,500. Comprehensive Travel Insurance Included. We will pay the actual cost of your comprehensive travel insurance, which includes trip cancellation, travel medical, and emergency medical evacuation. The amount of coverage we will pay for is equal to the amount of tuition with Muench Workshops. You just show us your receipt for the coverage and we’ll credit your account by the actual amount of the insurance coverage, up to a maximum of $4,000. This credit is netted against your final balance only. The insurance benefit from Muench Workshops only applies if you purchase your insurance through Ripcord by calling them at +1 (415) 481-0600. If you have other insurance or you purchase other insurance, this benefit does not apply and there is no additional compensation. Flights are into and out of Ushuaia, Argentina (USH airport code). Plan your flights to arrive Ushuaia on or before October 13, 2020. We recommend staying in Buenos Aires the night before, enjoy the city and ensure a timely arrival into Ushuaia on the 13th. It is important to note that embarkation is at 4:00 PM on October 14, 2020 and there is no possibility to reach the ship if you miss this departure. Flights home or elsewhere can be anytime after 11:00 AM (Ushuaia time) on November 4, 2020. Air tickets can typically be purchased beginning 335 days in advance, Muench Workshops will advise you when you can begin booking. 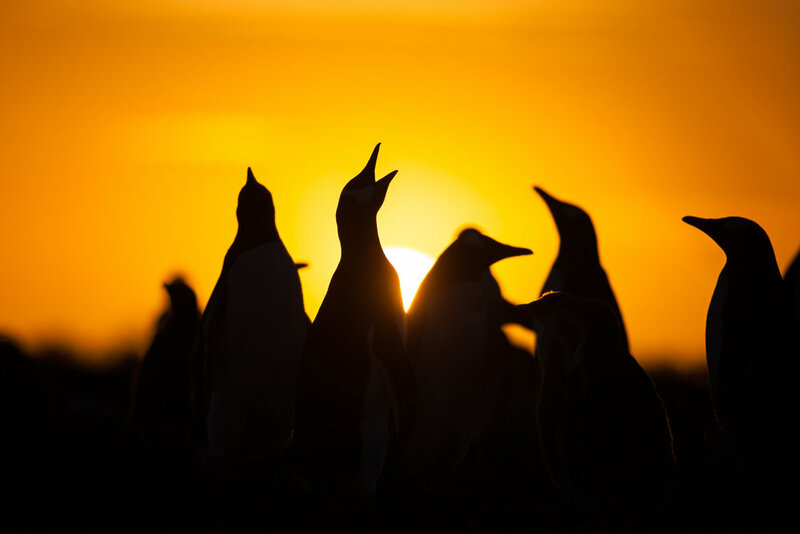 If you’ve had the Falklands, South Georgia, and Antarctica on your “must-do” photography list, if you want to photograph and capture amazing wildlife and polar landscapes, and if you want to be part of this jam-packed photography expedition, click the “Sign Me Up!” button below now!